Power Hungry has a simple premise: do-it-yourself power bar recipes that maximize taste and nutrition, minimize cost, and eliminate junky additives. Jam-packed with the best good-for-you ingredients (think whole grains, fruits, nuts) and all-natural, high-quality proteins, these recipes cover protein bars, endurance training bars and gels, granola bars, raw bars, and more. Whether you’re training for a triathlon, packing a lunchbox, or just need an afternoon pick-me-up, you’ll find recipes you’ll love—and nutritional info to boot. Skipping gluten, soy, or dairy products? No problem. These recipes are 100% soy-free and completely adaptable to gluten-free and vegan diets—no more scouring a label’s fine print. Power Hungry bars are incredibly easy to make and are endlessly customizable. There’s even a “knock-off” chapter for all of your favorite name-brand bars—minus the high prices. Still need convincing? How do these sound: Salty-Sweet Trail Bars, Morning Maple Bars, Flax Your Muscles Bars, Quinoa Chia Apricot Bars, Black Bean Protein Brownies, Green Tea & Ginger Bars, Greek Yogurt Muesli Bars, 5-Minute Protein Truffles, Carrot Cake Action Bars, and Sticky Sesame Energy Bars with Raw Chocolate Drizzle. 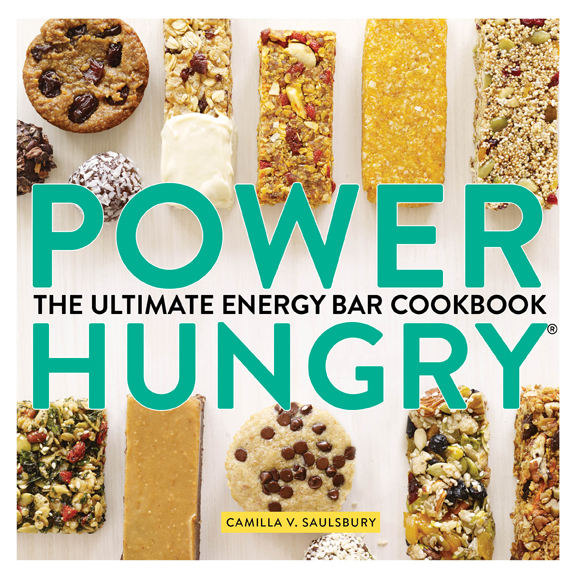 Camilla V. Saulsbury is a writer, recipe developer, fitness trainer, endurance athlete, and creator of the healthy food blog, Power Hungry.